That’s 9 items this month! This is fancy facial water delivered to your skin with a fine mist. The ingredient list is simple: water, nitrogen. The nitrogen is what makes it feel so cold when you use it and the water is fancy French thermal water with an optimal mix of silicas and minerals. I admittedly have very mixed feelings on this product. Do I buy into it really being a game changer in my skincare routine? Probably not. I do love the mist sensation, though I wonder if this water had some sort of infusion (like rose or tea tree) if it might be more effective as sort of a spray on toner. My favorite use for it so far in my experimentation is an application before I use an expensive serum or moisturizer. Having a damp face really helps extend the product and therefore you use less, which saves $$$. I also think for me personally it helps the product to absorb better. At the end of the day, subs like this one are for trying out new products you might never buy, and this full-size product was an impressive addition. I shampoo every 3 days or so, meaning dry shampoo is a must-have in my routine unless I want to look oily and gross. This clay-based formula dd the trick with gusto. Unlike some other brands, I didn’t have any powdery roots, even with excessive application. I do have lighter hair, so this might be an issue if you have dark hair or roots, but I honestly don’t think so. The instructions recommend leaving the powder in for 2 minutes after spraying, then using a towel to pay it away, though I found this to be a completely unnecessary step and just used my fingers to work it into my roots and then off I went. The smell was mild and a little fruity, but not so strong that it was very noticeable after a few minutes. This product makes me a little nervous because I know similar products can cause your natural eye color to darken (especially if you have green or hazel eyes). My natural eye color is a super light brown with a green ring, and I would hate to change it! I did a little research and I couldn’t find any warnings of such from this product online or in the included info sheet. There wasn’t much info at all really. Regardless this might be a product I use on my eyebrows instead, as that is also a suggested application location. Have any of you used this product over time with success? Any side effects? This sample s tiny, but a little goes a long way! It is a semi-clear gel and has no real scent. The formula’s hyaluronic acid gives your skin hours of hydration and the peptides and vitamin E help prevent damage from free radicals and ease signs of aging. It made my skin feel tighter and provided a perfect base for my foundation without using a primer. At this price point, I could never see it taking the place of some of my other similar products, but I am happy for a sample. I received this sample right after getting a bottle of the Sunday Riley C.E.O. Rapid Flash Brightening Serum AND a bottle of the Perricone MD Vitamin C Ester Serum. Basically, I have all the vitamin C in the world right now. This isn’t a complaint, because this ingredient is so great for your skin! It is an antioxidant and it helps your skin’s natural ability to produce collagen. It is no wonder why many formulas with high levels of this skin superhero promote its brightening power. My favorite of the three formulas I have right now would have to be the Sunday Riley because it is also ridiculously hydrating. While the Ren and Perricone are both gels and serums respectively, the Sunday formula is a heavy cream that my skin reacts so well to. If you read my reviews you know that I am a Perricone M.D. addict, so it pains me a little to prefer another formula over it! The advantage of the Ren is that you get more product for your money, though compared to the heavier hitters I did notice less of an immediate texture and brightening improvement. My skin is dry and reacts well to more powerful formulas but if yours is more sensitive, this product might be a more gentle and affordable way to try out vitamin C for yourself! The one drawback to ANY vitamin C formulas is that they often have a short shelf life and can be easily damaged by light. I recommend keeping them in the dark and perhaps in your fridge if possible! I have seen these samples floating around a lot lately, and though it is a quality cream for dry skin, I use and sample so many products that I personally need a few bells and whistles to get me really excited. 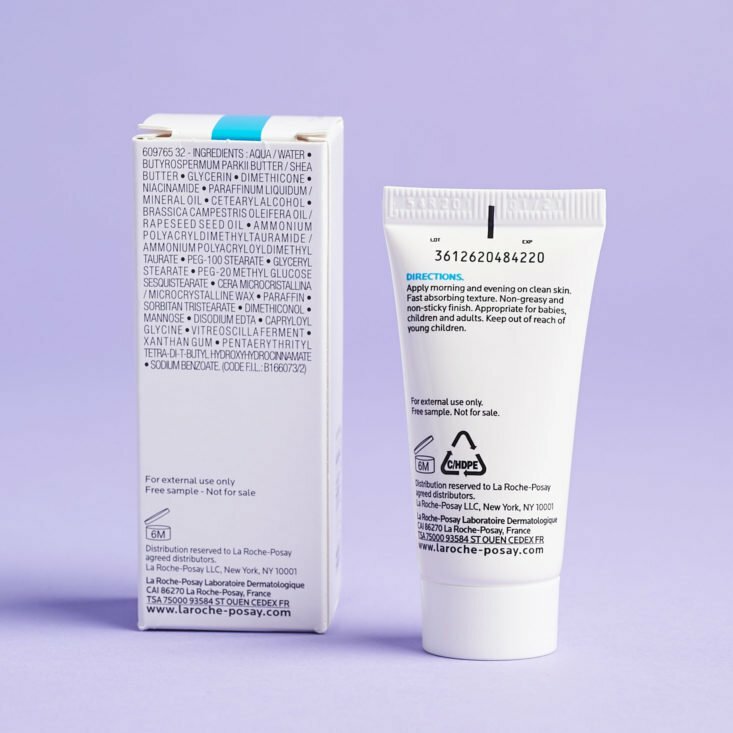 It is fragrance-free though, meaning if you have super sensitive skin or even eczema, this is a great little tube to have on hand and the full size is really reasonable for the price. I passed it along to my husband who prefers zero bells and even fewer whistles. Did any of you watch the cartoon version of Batman when you were younger? There was an episode where this man applies this face cream and then he turns into Clayface, a villain who had this clay-colored oozing face. That is EXACTLY what I felt like with this mask on! The color was spot on and since I applied it way too thick I was literally dripping all over the place for the 20 minutes I wore it while it dried. My husband really enjoyed it. All kidding aside, I haven’t used many rubberizing masks but I really liked this one! You mix this clear gel with powder and then apply the goo to your face. It takes a few minutes (and longer if you apply thickly) to firm up and rubberize. The whole thing was incredibly cooling and soothing to my rather inflamed skin. My face has had a rough week thanks to the chilling winter winds and this mask brought that irritation way down. Peeling it off was also super fun because it is just a little gross and shows all your skin texture in great detail. I would love to try more masks like this! I liked everything about this product aside from the smell, which is a big enough deal to disqualify it from my normal routine. I really do not like food scents (think pumpkin pie, artificial berries, apples, and cinnamon, etc) so this creamy mango fragrance was not for me. If you like tropical fruits though, you just might love this shampoo! It made my hair feel super clean without feeling bone dry and gave it a nice shine. I like this brand and I have enjoyed taking their Red Carpet hair formula for a few weeks now. This formula is meant to help clear your skin and body from toxins. It has a ton of good stuff in it like Chlorella, Zinc, Green Tea, and Spirulina, and even more. I wish we had received more than a 1 day supply, as this really isn’t to test out over more than a day. Verdict: This box has an estimated value of $126.74. That’s quite a value for a $24.95 box. This doesn’t surprise me, as Beauty Fix has consistently delivered high box values every month I have reviewed it! While not every product ends up being a favorite, the real value for me in this sub is that there is always a large number of high-quality products to choose from, so even if some items miss the mark, the other numerous items always make up for them. If you love trying out new and often unusual or hard to find products for a steal of a price, you need to try out this sub. Can you still get this box if you sign up today? As of publication, this box is still available! Alternatively, each of the 9 item’s has an average cost of $2.77. Check out all of our Beauty Fix reviews and the Beauty Subscription Box Directory! What do you think of the January 2019 Beauty Fix box? I have used the lash treatment for about four months and have seen a definite filling in of the areas that were sparse! I used it once on my lash line…burned a bit and I’ve never used since. Does anyone know if the smartlash is safe for the eyes? The description says that it is prostaglandin free so it does not have the glaucoma drug in it. You know your skin care girlfriend…love your very detailed reviews…I also learn alot about products included that normally are to small to fit that kind of info on sample. Thanks so much. I believe that only the PRESCRIPTION lash serums cause changes in eye color. “I passed it along to my husband who prefers zero bells and even fewer whistles.” Sounds just like my husband too! Maybe it’s just a guy thing. I finally got him to use a face cleanser instead of his Dove Men body soap, next is moisturizer. Baby steps! Mine does occasionally steal my clay mask for his nose, but that is the extent of his skincare experimentation! I tried to get him to try my sheet mask boxes with me but he was horrified. Love the shampoo including the smell and the way it makes it look! Leaves it so healthy and full looking! What box recently had CEO serum? I’ve gotten small sample sizes of CEO in a few places recently – Sephora and Birchbox come to mind – and it’s been included in some curated boxes for sale also. Allure just recently ran a promotion for a free full size for new subscribers and Allure and Glossybox both gave out full sizes in 2018. I wish I liked the stuff but it’s too greasy/heavy for my oily skin. I use the thermal water mist (or Evian mist) to wet my makeup brushes and Beauty blender! No build up and I never drop a brush into the sink! That is such a great idea, I’m totally doing that from now on! I became a big fan of thermal water after trying it from Beauty Fix. It is a multi-purpose product. Can be used as: toner, mid-day spritz, setting makeup, sooth sunburn, cooling at beach, after waxing, etc. I also read it is great to calm down irritated skin post-procedure. My favorite way is to use it at my very dry office to add moisture to my face. I love that skinmedica product and have been using it for over a year. My esthetician recommended it. It moisturizes my combination skin without any greasiness. I don’t know about the smartlash yet but it doesn’t burn my eyes like some other products have. Try the smart law on your brows. Works amazingly well. I am glad to see a few people with this recommendation! I am still recovering from overplucking them habitually in highschool. WHY did I do that? I haven’t tried the HUM sample yet…but it says it contains 3 days worth of capsules (2 per day for a total of 6). Just an FYI in case you want to amend your review. 😀 Now that I “refound” it in my stash, I’ll have to try it out today! Monday’s are for detoxing! Mine only had two capsules, which is odd then..
Oh wow…mine definitely has 6. I would love to hear the results & possible side effects on the lash serum from someone with light eyes as well. I’ve been afraid to use it on my lashes for the same reasons. The rubberizing mask severely irritated my skin & I do not have super sensitive skin. A few minutes after removing it & washing away the residue, my face inflamed & I developed a lot of small bumps on my cheeks & chin. I slathered on La Mer & it resolves in 2 days thank goodness. This is the only product I’ve received in a Beauty Fix box that has ever irritated my skin. I love the thermal water mist – well love it for my 14 year old daughter who uses it every night. It’s very soothing, and I’m convinced this healed her breakouts & has kept her skin super clear since (we received the smaller bottle in a previous box). I was about to reorder this for her when the spoiler was posted that we would be getting more – so definitely thrilled with this product. I use the smart lash and I have green eyes! My color has never changed! But that doesn’t mean it wouldn’t on someone else. They are safe to use I have light blue-green (aqua) eyes and been using these serums for years… the only ones that do change eye color now require a prescription. it doesn’t work as well as prescription strength like latisse, but I def see increased length with use. Hi Megan. I used Smartlash for my eyebrows for a few months and it did nothing for me. I wanted it so badly to work. I have read reviews that it works for some people. From the comments here it seems awfully hit or miss. I will have to try it out. Avene Thermal Spring Water – first I thought it is a gimmick too. My first bottle I could not swap fast enough. When I received second one, I decided to try and it was and still is a life saver for me. Right now it is very cold and inside heaters are running, this combination makes my skin very dry. I spray this water on my face during the day and it makes such a relief from all the dry air from heaters. Too bad they do not make it travel size. I recently took 12 hours flight and was craving this water on my face because flight air was so dry. SmartLash Eyelash Enhancer – I use this product for about 4 months now. There is no dramatic difference but I think it does keep your lashes healthy. My eye color, light green, did not change. However, when I put the product, it does irritate and sting my eyes. I always try to put very little on lash line to avoid getting the product into eyes. This is so good to know! Makes me want to give it more of a priority over at least a week and see what I think then. Thanks so much for reading and leaving your experience! Weird, it looks like it is almost exclusively skincare items, with a couple other extras.